The patented Urilock trap fluid is an integral part of all Uridan waterless urinals. 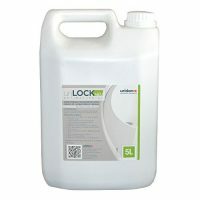 The Urilock fluid provides a liquid odour barrier like a normal trap. No odours can get though the liquid barrier and since there are no membranes or moving parts the design works 100% of the time. The fluid is 100% odour-free and biodegradable. The trap change is 300ml per urinal, which is required every three months. The 5 litre conatiner is enough for 16 trap changes or to keep one urinal going for 50 months (4 years). Zero odour + Zero chemicals = Perfect Hygiene. The centrepiece of the uridan® urinals is the patented uridan® odour trap: This odour trap works with the aid of urilock®, a special blocking fluid. urilock® consists of plant-based substances and is biodegradable. Due to the fact that it is lighter than urine, the heavier urine automatically flows directly down the drain. The lighter urilock® stays on the surface and works like a liquid lid that blocks out all drain and sewage odours. The waterless uridan® urinals are more hygienic than conventional flushing systems. The moist environment in conventional flushing systems actually encourages the development of bacteria and fungi on the surfaces. In addition to protecting the environment, uridan® urinals also protect your bank account. Just one uridan® urinal saves up to 200,000 litres of water per year, which in turn saves you money.